Paramedics said the man had been dead ten to twelve hours when the ticket was given. The officer had taken the time to observe the parking violation, write a ticket, then stick his hand through the open window (within inches of the body stiffly sitting upright behind the steering wheel) and placed the $30 citation on the dashboard. He never noticed the man was dead. If the Pharisees could lead the masses to believe the Jesus associated with sinners because he is one Himself, then His work would be aborted. 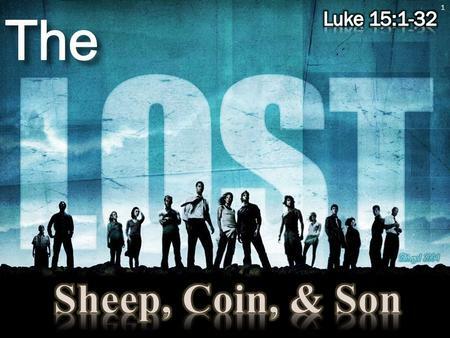 In answer to these scandalous charges Jesus used three parables to answer them–Three of his most famous parables–the lost coin, the lost sheep the lost son. The three parables have several things in common. All were lost. Each was fervently desired. And all were received with rejoicing when found. But there were some differences. One was an animal. The other an object. But in the final parable, a human being was lost. The sheep wandered away by sheer animal instinct or impulse. The coin was lost through the fault of another person. But the son chose to leave of his own free will. The prodigal chose to demand his inheritance. Leave his father’s house. To journey into the far country of sin. To engage in wild, reckless and immoral behavior. To waste his inheritance. He was lost mentally, emotionally, and relationally. But more importantly, he was lost spiritually. But the parable reveals a beautiful, insightful and encouraging revelation. The son “came to himself.” And he began the road to recovery. He remembered what he had left behind. He resolved to go home. He regretted his actions. Repented of his wrongs. And returned. The Father in the parable, who apparently was hoping his boy would one day return, received him home with rejoicing, with a robe, a ring, and sandals. He threw a party to celebrate his son who was lost but now found. Dead, but now alive. He restored him to his place in the family again The Father’s love, compassion and mercy was representative of the Heavenly Father’s concern for sinners. Sadly the elder brother was bitter, accusing and jealous. He wouldn’t join in the merrymaking. He symbolized the attitude of the Pharisees who showed contempt for sinners. How do we treat our unfaithful brothers and sisters in Christ? What is our attitude toward those entangled in sin and ensnared in Satan’s grasp? Do we eagerly seek and search for those who are lost? Is our attitude one of rejoicing when a sinner repents? Who are we most alike? The Father or the elder brother? Jesus or the Pharisees? Good stuff Ken, thanks for sharing and reminding us of what we all really need…Jesus! Thank you sir, I needed this.